When Fiona Thorn, an ornery orphan with an expertise in explosives, sets out to rescue her imprisoned friend, Jaydin Rowan, she wants nothing more than a few sleeping guards and a satchel full of Blast. What she gets is a run-in with three bickering princesses that puts all four girls on the wrong side of a locked dungeon door. Now, accidentally involved in a plot to assassinate the King and accused of kidnapping the princesses, Fiona must find a way to free them all, save the King, and rescue Jaydin, all while struggling to pay the magical debt that's slowly killing her. Unless, of course, the princesses' annoying sibling rivalry kills her first. 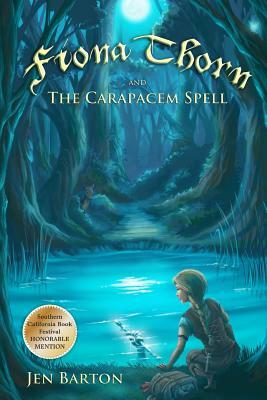 Packed with powerful magic, fun-loving fairies and a vicious ogre turned pet, Fiona Thorn and the Carapacem Spell is a fantasy kids' book sure to become a favorite in middle grade fiction. Jen Barton was born in Williamsport, Pennsylvania in 1971 and spent much of her life on the East Coast. In 2008, at age 36, she and her family moved to California. With two cars, she and her husband moved two dogs, two guinea pigs, a cornsnake and their 10-year old daughter across the country. She counts the five day road trip, including a near escape by both dogs on Day 3, as one of her best experiences to date. In 2009, with a Bachelor of Arts in English and Philosophy from Millersville University, Barton realized her childhood dream to become a writer. One van full of bored kids, one long day of travel, and Fiona Thorn was born. She's been writing ever since. When not taxiing her teenage daughter hither and yon, Barton loves reading (especially fantasy by George R. R. Martin), cooking (anything with pasta is a hit), and writing (magical worlds with obstinate teen girls is always a favorite).